We recently were working on a home design, and one of the issues was that there was need for a guest room. Unfortunately, both extra rooms needed to be used as a home office. Solution, Murphy beds! For those of you in the dark about what is a Murphy bed, it’s a wall bed that folds up during the day to save space. Once we started doing some research, we discovered not only could you create a well designed room around one, but you could learn how to build a Murphy bed! This could save you potentially a couple thousand dollars. Yep, you read that right. Perfect for a tight space, DIY Murphy beds take any space in your home into double duty. Add guest space, or turn a small room into both a bedroom and a playroom. Create a studio apartment style space in an attic or a corner basement room… the ideas are endless. This isn’t a small DIY project to be sure, but one that is worth the effort in both money and space saved! First we have this DIY Murphy bed by Jacque and Matt from ‘DIY Village‘, and it’s a good one! Lot’s of photos, and they were kind enough to share where they bought the Murphy bed hardware kit. (That incidentally came with a cut sheet, instructions and a DVD!) What a nice job! Just add a nice mattress. When folded up, this just looks like a nice built in storage unit. Need room for kids? ‘DIY Network‘ shows us step by step how to build a DIY Murphy bunk bed. If you have several kids, you know that this is almost like getting an extra room built onto your house! ‘Apartment Therapy‘ brought to our attention that adding a double Murphy bed might just allow an expanding family to avoid buying a larger, more expensive home. Therefore, it might be worth the expense, even if you don’t want to DIY it. This one from ‘Casa Kids‘ looks as if it would definitely stand the test of time, and might warrant it’s price tag. We LOVE ‘Ana White’… she has more building plans and tutorials for DIY’ers then anyone we know, and they are free! One of her readers shared their version of her rustic DIY Queen wall bed, and it looks great! Just goes to show, DIY Murphy beds are in a DIY’ers capabilities. Another ‘Ana White‘ readers project, this full size Murphy bed would fit in a smaller space more easily… Also with free plans and instructions! The Moddi Murphy Bed is genius for anyone trying to save some money… Their plan and parts list includes only parts that you can buy from the hardware store or IKEA. They also claim you can make the entire Murphy bed for under $275… That is a fraction of what it would cost to buy one. Google it, I’m serious. Their plan does cost $7.95, but that’s chump change compared to what it could save you. Oh, did we mention, it also has this cool modern Murphy bed vibe we haven’t seen in any other plan? Love this! ‘Plans Now‘ has another plan you can download for just a few dollars, and has everything you need to make your own DIY Murphy bed, including a cutting diagram. Just add one of those nice memory foam mattresses and you or your guests will be in heaven! 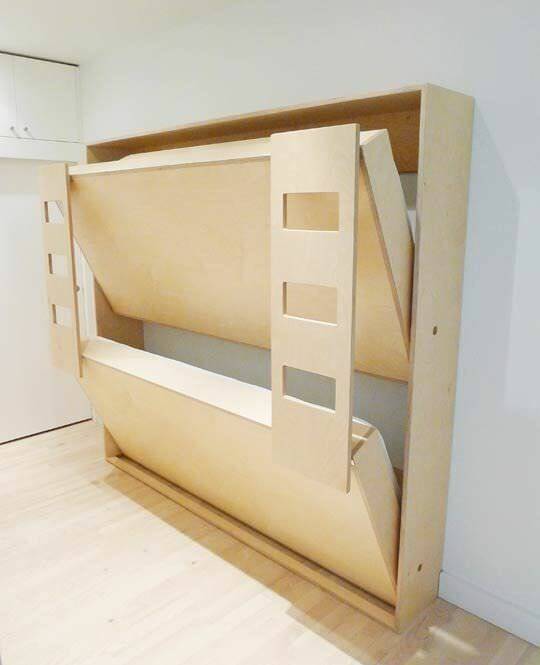 ‘IkeaHackers‘ made this Ikea hack Murphy bed that is designed to fit into a closet. Made from Ikea Pax cabinets, the tutorial has photos to show you just how they made this DIY wall bed. Finally, we have this really cool and different roll out guest bed from ‘Tiny Revolution’, This is made with an accordion style base, and is perfect for the tiny house. The plans are still free, even thought the page has a time expiration on it. Really clever solution to a small space! Feature photo from furniture designer ‘Roberto Gil‘. Love this bookshelf Murphy bed. What more could you want? If you love the idea of a Murphy Bed, but don’t want to build one from scratch, you can order a kit from ‘Wayfair‘. 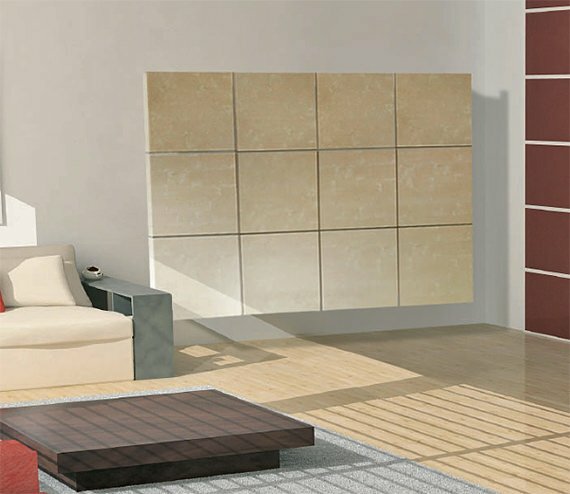 We like this “Walley Murphy Bed” because it comes with the attached storage unit! And, it looks great when it’s folded up as well. And, dozens of 5 star reviews! You can get it in other finishes as well as other sizes. If you enjoyed our post on DIY Murphy Beds, you might also be interested in 9 Amazing DIY Bunk Beds or How to Reupholster Almost Anything! hi i am empress for the double deck bed…for my kids can i have copy the lay out? All the projects have links directly to the project directions. I too am interested in the Murphy bed w/cutting or work table on reverse side. I love all the ideas i see. Were can i get rhe plans . 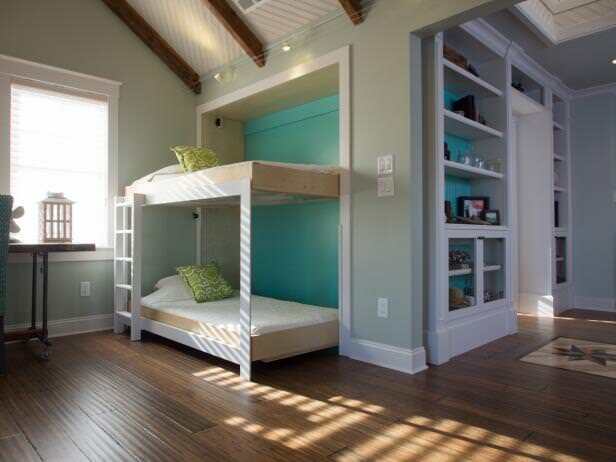 For this beds? Which bed Jerry? They should all have links! I want a plan for a twin bed for in our Office/ sewing room, with a drop down cutting table when the bed is up and not in use. Some how it would hide in the door with the leg or legs. When bed is in use it would be flat to the underside of the platform. Anyone have one they have made? Rockler has plans online for purchase. I have a store close by to go to. Built my own Q size murphy bed. VERY comfy! Me too …please ! Our upstairs has scoped ceilings so a twin on its side would work fabulously. If anyone sees a plan for this I would love to see it. What amazing ideas you have here! I did a post recently about my home office and I expressed an interest in using a Murphy Bed so a reader sent me a link to this page. Pinning for future reference! !